Custom made angel wings and simple Celtic cross are combined to form a distinctive pendant. 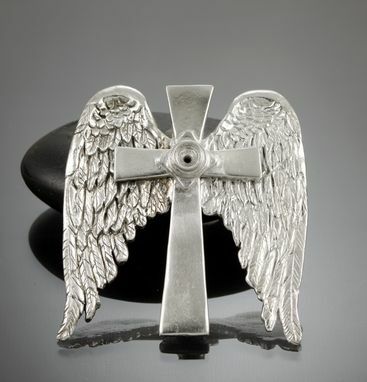 The cross has a bezel set 5mm Moissanite diamond set into the center. The entire pendant, which is substantial, hangs on a rope like chain of silver and argentium which doesn't tarnish. 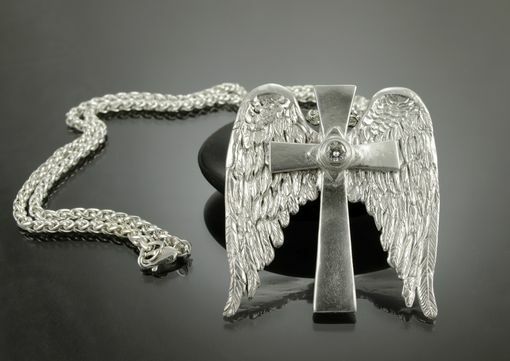 This piece can be customized with a different stone, a top bail instead of a hidden one, and decoration on the cross.